Looking for a Spa Day at the Airport? With traveling as draining as it is, there’s no surprise that stress-relief businesses have taken up residence in airports around the world. Spa days are becoming a thing at the airport. Travelers who are looking for a bit more than mechanized massage chairs now have something more substantial to ease their tension before or after a long flight. Weary passengers can take a load off with yoga classes, nap pods and now even spa services in some major airports. Keep reading for details on the newest trend and the best airports to enjoy some relaxation. If flying makes your skin feel dry and flaky, a trip to Absolute Spa is just what you need during your long journey. Splurge on the 60-minute Soother Facial that incorporates aloe vera extract and rose geranium to reduce redness and keep skin feeling hydrated and supple for the entirety of your flight. They even have anti-fatigue and jet lag treatments to help you hit the ground running. If you have a lot of time to kill before you take off, you might as well spend it doing something enjoyable. For only $40, you can purchase an all-day spa pass to Hilton’s Eforea Spa where you can relax in the whirlpool or sweat out toxins in the sauna. They even have a steam room for you to relax in as well. Not looking to lay around? Utilize their gym equipment to break a sweat and compensate for all the sitting required with travel. Now that’s what we call an enjoyable layover. 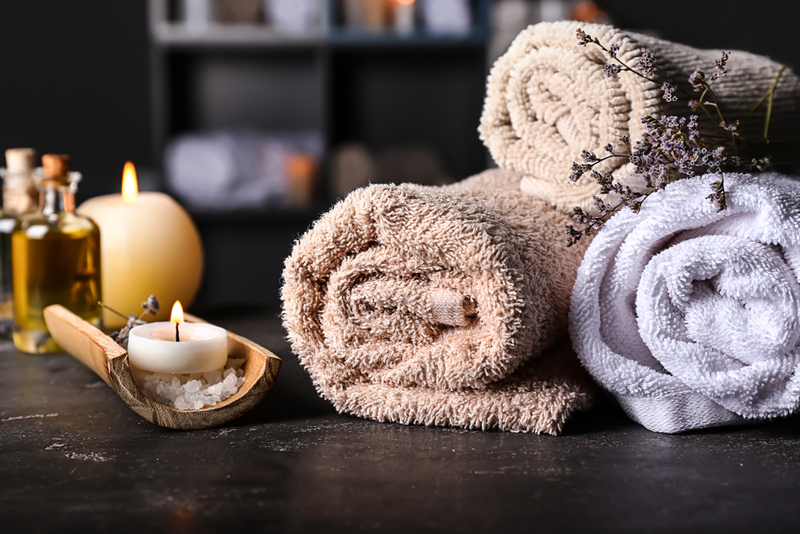 All locations of the Be-Relax Spa chain offer the same essential amenities: chair and table massages, steam room and aromatherapy treatments as well as a beauty and juice bar. But what makes the Dubai location unique is that it offers a Virtual Reality Massage. You heard that right. You’ll wear a virtual reality headset that plays a variety of tranquil scenes while you lie back and enjoy a relaxing foot massage. This may just be the most high-tech massage you’ve ever experienced. Though it’s filtered and recirculated, airplane air isn’t exactly mountain air. There’s less oxygen in a pressurized cabin than on the ground, and it’s drier than the desert. To help recover from the airplane environment, the OraOxygen full body massage ends with 15-minute oxygen treatments. If that’s not your cup of tea, the spa also offers a full menu of items including manicures, chair massages and even waxing services. XpressSpa is located inside of airport terminals, but you’d never guess it based on their luxurious treatments. Indulge in one of the best facials you’ve ever had. Looking for an enriching seaweed facial? How does a cryotherapy facial sound? What about their famous Golden Glow Gel facemask, you’ll be sparkling afterward from the real bits of gold. You don’t have to just get a facial either. If you’re looking for a little trim or maybe an up-do before a wedding, you can definitely stop by the XpressSpa to get glammed up. For a truly unique spa experience, visit the Wellness Oasis in Singapore to try the memorable fish pedicure. Instead of dunking your tired feet into a basin filled with warm water, you’ll be dunking them into a tank of garra rufa. These little fish eat away at the dead skin, leaving your feet silky smooth. There are also showers and light refreshments available at the spa if you’re not feeling so fish-friendly. This beautiful spa and fitness center in Qatar is so lovely, you just might forget you have a flight to catch. For less than $50, you can enjoy all of the center’s facilities. You can soothe achy muscles in the hydrotherapy tub, squeeze in a workout at the gym or swim laps around the Instagram-worthy glass-enclosed pool. No worries if you didn’t bring shampoo deodorant or lotion, they have those available for free. If you want to upgrade your experience, you can fight jetlag with an anti-jetlag massage or rent out racquets to play racquetball in their squash courts.